Minutes after a plane carrying 113 people crashed on takeoff from Havana airport, Cuban state media filled with minute-by-minute updates, cellphone video from the accident and an interview from the scene with newly named President Miguel Diaz-Canel. When Tropical Storm Alberto struck the island later in May, causing nearly a dozen deaths, state television broadcast unusually lengthy footage of meetings among ministers coordinating the response. 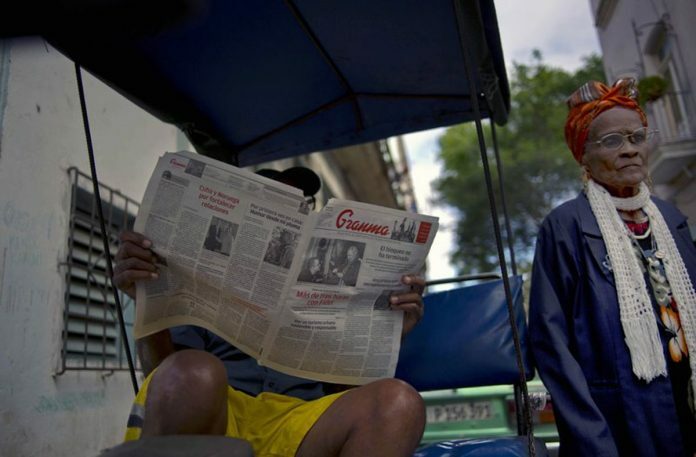 Cuba forbids independent print or broadcast media, and reports in the state-run press have long consisted mostly of transcriptions of official Communist Party declarations — triumphal reports on industrial production or lavish praise of the country’s leaders. That turgid style appears to be incrementally changing in the wake of Diaz-Canel becoming president in April. Cuban journalists tell The Associated Press that the Political Bureau of the Communist Party, one of the country’s most powerful bodies, recently approved a document known as the “New Communication Policy” that is aimed at giving state media more ability to report news like their colleagues do in other countries. The new policy was approved sometime in the first three months of this year, when Diaz-Canel was vice president and had responsibility for the country’s media and communications policy. It went into effect around the time Diaz-Canel took over on April 19 from Raul Castro, whose 10-year administration released virtually no information about its operations to the Cuban public or international media. The Cuban government has yet to say a word publicly about its new communication policy. But state journalists said the goal is to compete with the spread of information from alternative online sources. Cuba has one of the world’s lowest rates of internet use, but access has been expanding rapidly and Cubans who get online can find a nearly unlimited range of media outlets — from independent Cuban online magazines to anti-Castro outlets funded by the U.S. government. Many of those sites are blocked but their content can be accessed through Facebook and other social media. The country now has nearly 2,500 internet access points, although the hourly cost of $1, roughly a day’s average wage, makes getting online prohibitively expensive for many Cubans. Independent Cuban online media operate in a gray area — neither explicitly legal nor illegal, and generally tolerated if they avoid controversial topics. “This policy comes in response to complaints from state media and from society at large, and to a necessity (for more information) that the government and party have recognized and that has become much more evident as internet access in the country has grown,” said Jose Raul Gallego, a writer for the independent website El Toque. Under Cuba’s constitution, the Communist Party issues general directives to the Cuban government, which then passes laws and regulations putting that guidance into effect. Many elements of the new media policy appear far from becoming reality. Others have been communicated to a select group of journalists who appear to be serving as a test group. Many expect wider distribution of the policy and even its passage into law later this summer. The policy allows directors of newspapers, television and radio stations to put out news of important events like fatal disasters without awaiting the previously mandatory authorization from the Communist Party’s Department of Ideology. That change could be seen in effect during coverage of last month’s plane crash, which left a sole survivor. The new policy also allows advertising, including from Cuba’s small private sector, and it would create a new media regulator independent of the Communist Party, as well as public relations departments in national ministries and municipalities, a standard feature in most governments that missing in Cuba’s single-party system. “The monopoly on information in Cuba is being contested,” said Elaine Diaz, founder of the independent news site Periodismo de Barrio. However, many advocates of greater transparency in Cuba doubt the new policy will do much to help. While international media dove into the troubled history of the Mexican charter company whose plane crashed outside Havana, Cuban media have shied from anything resembling investigations or calls for accountability.